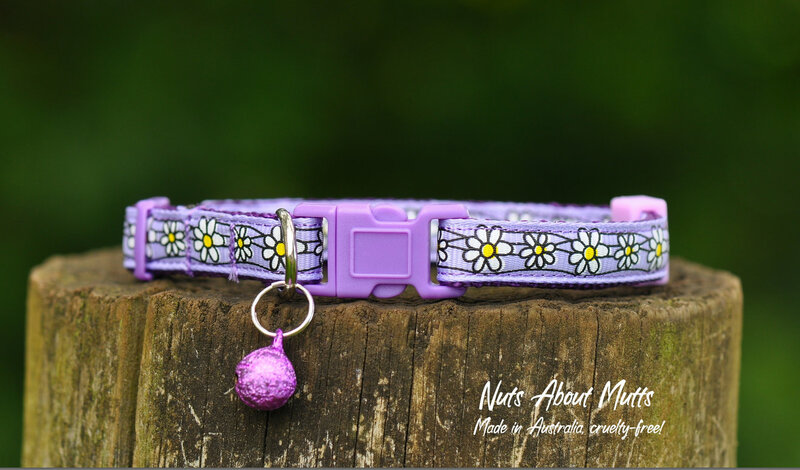 Daisy Chain cat collar Lavender FREE SHIPPING! $15 all sizes includes free shipping within Australia. Outside Australia? Email info@nutsaboutmutts.com.au for a shipping quote. NO MORE BORING CAT COLLARS! Pretty daisy chain print in lavender. The collar features a breakaway safety buckle and silver bell. X-SMALL, fits neck 15-25cm approx. Width 10mm (1cm). SMALL, fits neck 20-30cm approx. Width 10mm (1cm). SM/MED, fits neck 25-35cm approx. Width 10mm (1cm). Don't see your cat's size here? Email us and we'll make one up for you! Also available for puppies, small dogs, teacups etc.